Wharton began his football in the Bolton Sunday School League and also captained Bolton's schoolboys team for two seasons. He was recommended by manager Bob Jack's son, David, and in October 1935 was signed on amateur forms at the tender age of 15. A week later he featured in a special practice game and was reported to have shown "outstanding talent". Wharton spent the next two years as a member of the ground staff, whilst also playing in Argyle's 'A' side. He continued to impress, one report saying that "he showed remarkable ball control, and made a speciality of surprisingly quick and accurate passes". The small, lively winger earned a professional contract on this 17th birthday in June 1937 and made his Football League debut in September 1938 at just 18, impressively scoring a brace for the Pilgrims in the 2-1 home win over West Bromwich Albion. Such was his early prowess that some imagined him as a successor to the great Sammy Black, who said goodbye to Home Park in 1938 after 14 years with the club. 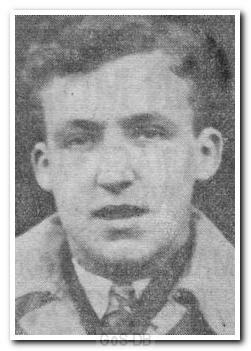 So it came as a shock when Wharton was snapped up by top-flight Preston North End in July 1939, along with team-mate Jimmy Hunter in a double deal that manager Jack Tresadern said was substantial. Only weeks later his bright future came to a shuddering halt when the outbreak of the Second Word War put an end to the Football League for six years, but he was young enough for the conflict not to spell the end of his footballing career. In the years that followed he established himself with Preston in the wartime leagues, for one season playing alongside the great Tom Finney, and also made wartime appearances for Blackburn Rovers and Bolton Wanderers. In 1947, after a total of 28 full Football League appearances for Preston, Wharton moved on to play 23 times for Manchester City, followed in 1948 by a four-year spell with Blackburn Rovers, where he amassed 129 starts. His last League club was Newport County, where he played 74 times between 1952-1954, before winding down nearer home with non-league Wigan Athletic. Wharton's son Terry, also a winger, played League football in the late 60s and early 70s for four clubs, including Bolton Wanderers. I recently read a copy of the match report from the Wiltshire v Devon county match played on 23rd January 1937 in Melksham. It refers to a 16 year old called "J Wharton" described as working in the office at Plymouth Argyle in a clerical capacity. The report expects him to do great things in the professional game. Source Wiltshire Gazette 29th January 1937. I thought you would be interested as it puts Jackie Wharton in Plymouth a bit earlier than your entry for Jackie Wharton on GoS, assuming that the "J Wharton" in the report is the Jackie Wharton who played for PAFC which seems likely. Many thanks Neil. I've dug deeper and found reports that confirm what you discovered, so have changed Wharton's profile accordingly. Much appreciated! Jackie Wharton holds the record for both father and Son (Terri) to score on their debut and both playing professional football at the same time.